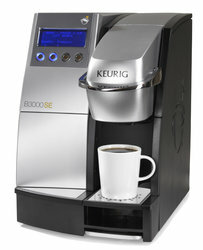 Keurig K-3000SE Commercial Coffee Brewer. A full-featured brewer that has direct-water-line plumbing for unlimited back-to-back brewing in under a minute. This brewer also has an LCD interface that provides step-by-step brewing instructions. Available in the Atlanta area only. All K-Cups and related products must be purchased from CV Coffee.